National Science Week 2019 takes place from August 10 to 18, with thousands of events and activities expected around the country. Media alerts, stories and talent highlights are included below. National Science Week on Facebook. For more information contact: Tanya Ha on scienceweek@scienceinpublic.com.au, 0404 083 863 or (03) 9398 1416. Congratulations to all of the successful recipients in the 2019 National Science Week grant round. A total of $723 000 has been awarded to 53 projects. Can you get a decent cup of coffee in space? What makes a cell turn into cancer? Why are Port Adelaide’s dolphins special? National Science Week grant projects will explore the far reaches of the universe through a travelling observatory, an art exhibition, virtual reality and a multimedia experience of gravitational waves. Sustainability will be a focus for Perth’s suburbs, the Indigenous knowledge of Tasmania’s midlands will be shared and celebrated, and Rob and Dean from The Curiosity Show will team up with the Victorian Youth Symphony Orchestra. The projects are listed below in the state or territory where the lead applicant is located. Citizen scientists from around Australia are helping scientists and reef managers get a much better picture of the health of the Great Barrier Reef. So far, they have looked at over 2.7 million points on more than 170,000 underwater images of the Reef and told us whether they can see coral, algae or sand. They’re all taking part in Virtual Reef Diver—the ABC’s online citizen science project for National Science Week. Coober Pedy under the sea, Perth’s slug census, what makes us human? 110 events and exhibitions, 13 online activities, and dozens of great stories and talent. National and international talent, researchers, experts, and other interesting people available for interview around the country. Plenty of photo opportunities. What can Western science learn from 60,000+ years of Indigenous knowledge and culture? 166 events and exhibitions, 13 online activities, and dozens of great stories and talent. 344 events and exhibitions, 21 online activities, and dozens of great stories. 382 events and exhibitions, 22 online activities, and dozens of great stories. Can we edit away epilepsy? And is it as easy as it sounds? Whisky business: what happens to whisky when combined with liquid nitrogen? 422 events and exhibitions, 22 online activities, and dozens of great stories. Humans 2.0: what’s the future look like for humanity? Moving climates: theatre, dance and digital art that deals with the data of disaster, Canberra. More on these highlights below, and others at www.scienceinpublic.com.au/science-week, and on Twitter at @SciWKMedia. 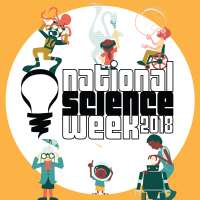 More than 2,000 events are registered for National Science Week 2018, which runs until Sunday 19 August. Media kit at www.scienceinpublic.com.au, public event listings at www.scienceweek.net.au. 347 events and exhibitions, 20 online activities, and dozens of great stories and talent. How do microbes turn grape juice into wine? How are mobile devices and apps affecting our mental health and how can they be used as a force for good? How will climate change affect whisky? Talk about your health for the Health Box Stories podcast, Hobart. 300 events and exhibitions, 19 online activities, and dozens of great stories and talent. 129 events and exhibitions, 12 online activities, and dozens of great stories and talent. Can dance help disadvantaged girls to engage with science? Visiting US dancer says yes! 162 events and exhibitions, 12 online activities, and dozens of great stories and talent. 7pm in Adelaide with astrophysics and the announcement of the Science Excellence Award winners at the Adelaide Convention Centre. Plus, dozens of MPs and senators will join CSIRO Scientists in Schools to launch Science Week locally in their electorates or regions. See our state highlights for New South Wales, Queensland and Western Australia. We’ll have daily highlights each day of the Science Week’s nine-day ‘week’ at www.scienceinpublic.com.au/science-week and on Twitter at @SciWKMedia. Scientists and event organisers are available for interview throughout the week – contact Tanya Ha on tanya@scienceinpublic.com.au, 0404 083 863 or (03) 9398 1416. Can science help us fight the war on waste? Help build a better picture of the Great Barrier Reef’s health, without getting your feet wet. Who will win tonight’s South Australia’s Science Excellence Awards? What can maths and science tell you about politics and voting? Grape expectations: what’s the future of wine? And what causes white wine haze? Who will win the ACT Scientist of the Year?